This Arts & Crafts Project Is for the Birds! 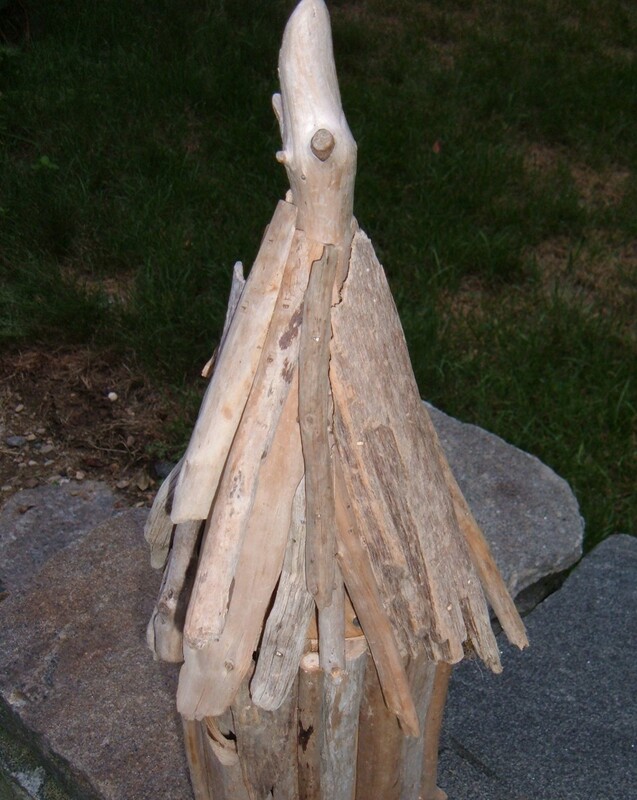 DIY Birdhouse Plans: Walking along the beach, I often find pieces of driftwood washed up along the shoreline. The sun, sand and water strip away the bark to reveal the grain and then infuse the wood with a weathered patina that is unique to seasoned driftwood. Driftwood is a popular material for Arts & Crafts projects, and several of the local artists are very creative at incorporating driftwood into their work. 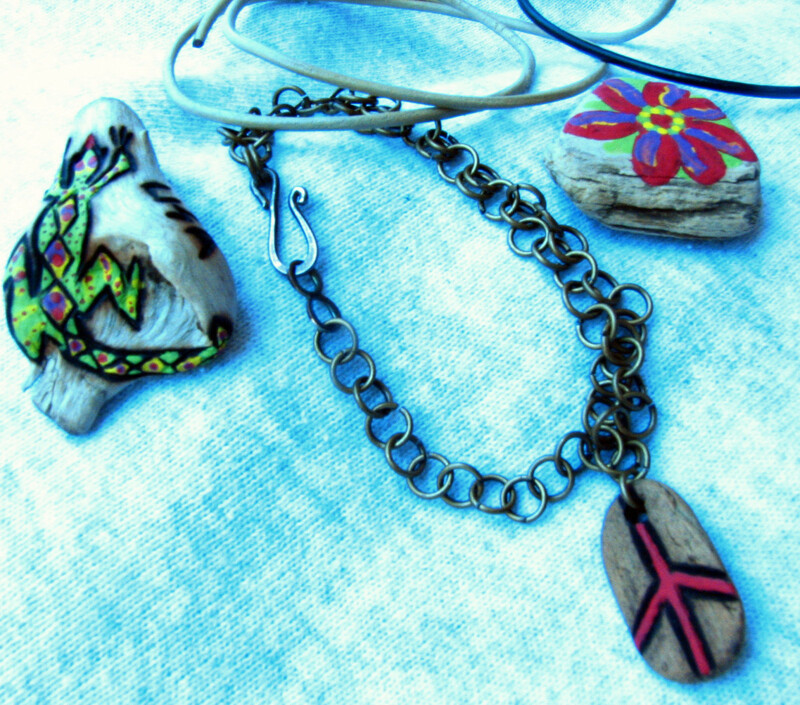 Inspired by their creativity, I looked for different ways to use driftwood into my projects. After all, there is nothing better than free materials, and searching the beach for pieces of wood that wash up with the tides is fun. As I walk along the beach, I collect the pieces with interesting shapes and characteristics, and I use the larger pieces to make stands for shorebird carvings. After collecting a basket of wood from the beach, I decided to try adding driftwood to one of my favorite woodworking projects. 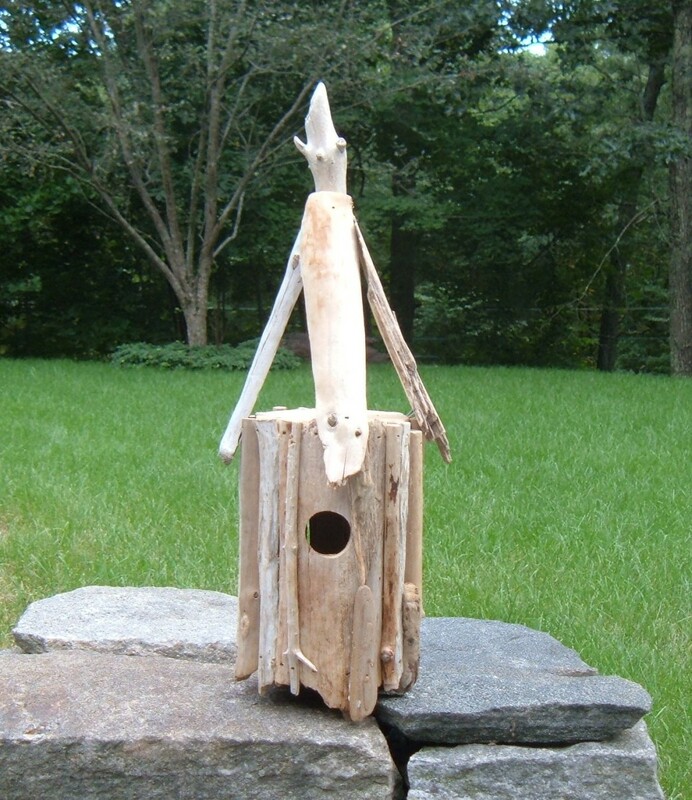 The result is this Driftwood Birdhouse. Building this Driftwood Birdhouse was a lot of fun, and it is almost like creating a free-form puzzle out of the oddly shaped bits of wood. I had an idea of what I wanted to make and how I thought it should look, but I was not really sure how the project would turn out. 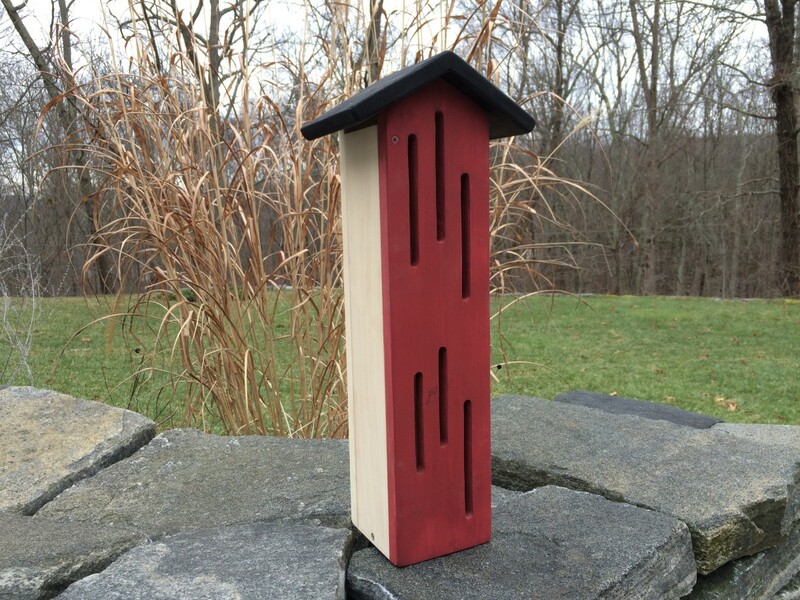 I'm pleased with the result, and here's how I built this little birdhouse. The materials list for this project is short, and I found the few small pieces of pine that I needed in my scrap bin. 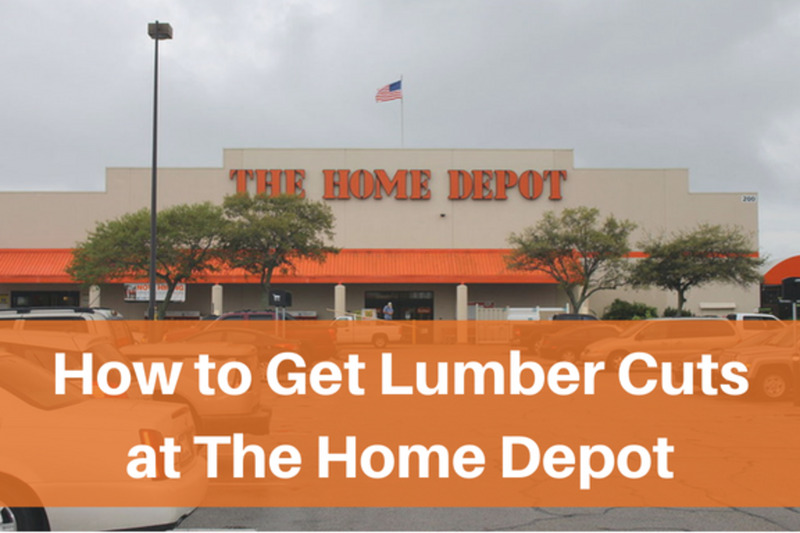 The exact size of the birdhouse is not critical, especially if you plan to make a decorative piece for display, and you can adjust the diameter of circular pieces and the length of the posts. I designed my birdhouse for use outdoors, and hope to attract a pair of birds looking for a place to nest. Birds can be fussy when searching for nesting sites, so I used dimensions that appeal to small cavity nesting birds such as chickadees. The two circles are 5-1/2 in diameter, which is a good floor size and creates a roomy interior. The 7" height of the posts allows the placement of the entrance hole about 4-1/2" above the nest box floor. 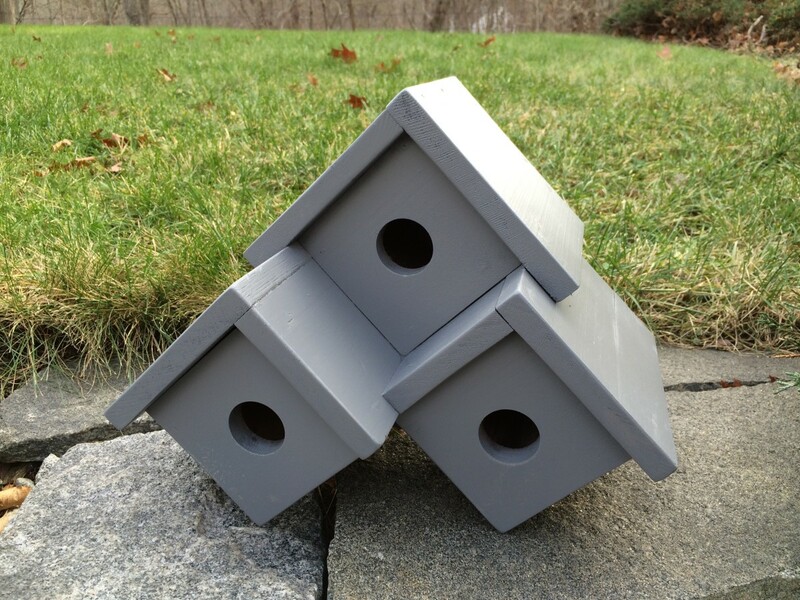 Though I used several power tools to cut out and shape the pieces, the simple construction of this birdhouse lends itself to basic hand tools. The unusual shapes and sizes of the driftwood branches created a construction problem: How can I attach the pieces together to form a sturdy structure that looks like a birdhouse? After a little thought, I came up with the idea of building a basic frame for the main section of the nesting box. The pine wood circles used for the bottom and top of the nest box provide a solid base for attaching the driftwood pieces to form the sides, with the 3/4" x 3/4" posts providing plenty of strength for support. Start by marking the circles on to a piece of 3/4" stock. I used a compass to draw the 5-1/2" circles, but you could also trace the outline of a coffee can or similar round object. Cut out the circles, keeping the blade of your saw just to the outside of the line. The circles do not have to be perfectly round, and you can sand or file the edges as needed. Drill a pilot hole through the center of one of the circles. This will be the top piece of the cylinder that forms the main section of the birdhouse. Cut a stout piece of driftwood to create the center post for the roof. The piece I used was 11-1/2" long and just over 1-1/2" in diameter. The decorative end was chewed by beavers before drifting down to the sea and makes for an interesting finial on top of the finished birdhouse. 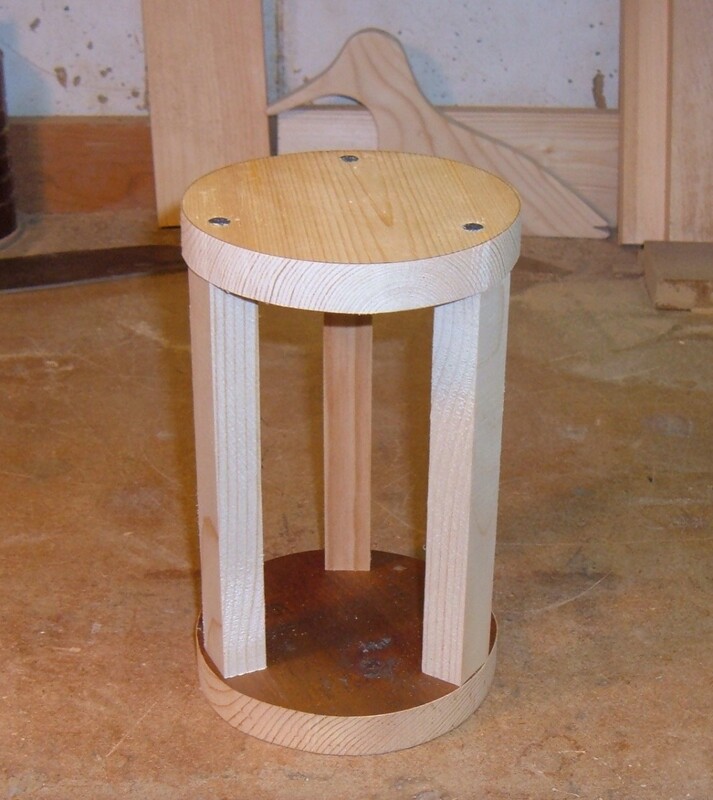 Attach the center post to the wood circle with a screw. 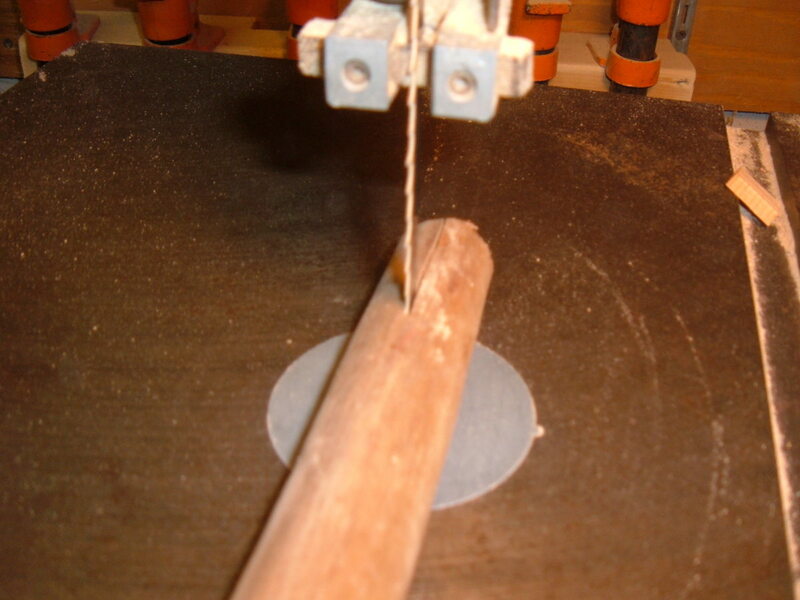 It is easier to attach the center post to top circle before assembling the rest of the frame. Next, position the three posts equally around the base to form a pillar. Mark the locations and pre-drill the holes to minimize splitting the posts. Then secure the pieces together with screws. Drill a few 1/4" holes through the bottom of the cylinder for drainage. It takes quite a few pieces of driftwood to sheath the outside of the birdhouse: I used over 25 pieces to enclose the 5-1/2" diameter cylinder, plus more pieces to fill the gaps. Another 20 or so pieces were used on the roof. 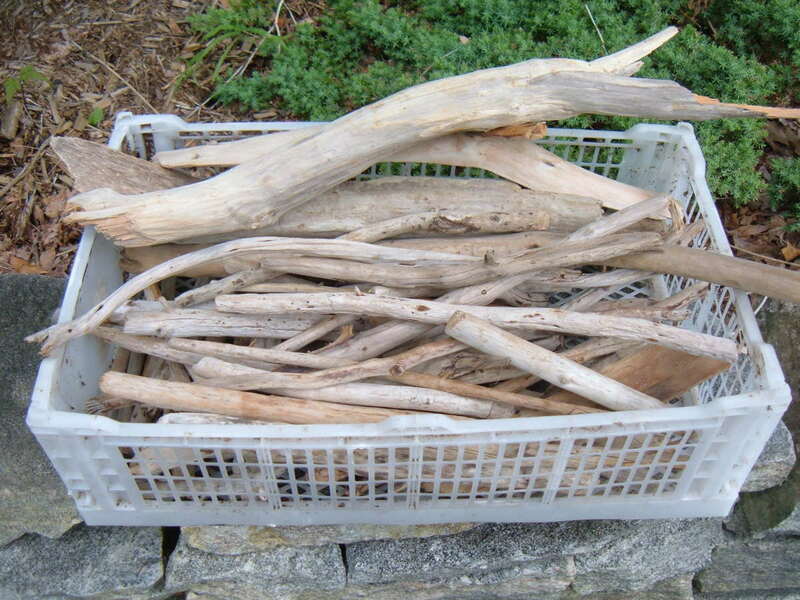 I sorted the pieces of driftwood by length, diameter, and shape. Finding enough straight sections to sheath the outside of the birdhouse was challenging, but it was also a lot of fun to fit together the different pieces of driftwood to create the siding. Each piece used is cut to length, with the cut end nailed to the top of the cylinder. This way, the naturally weathered ends of each piece are visible, extending below the bottom of the cylinder. After adding the roof pieces, you cannot see any of the cut ends of the side sheathing. I started the sheathing process by selecting a piece of wood to use as the main section of the birdhouse with the entrance hole. I drilled a 1-1/2" hole through the center of the piece, positioned so that the entrance hole is about 4-1/2" above the interior floor. I nailed the first section in place using a pneumatic brad nail gun, but you can also nail the pieces together using finishing nails. Working around the perimeter of the birdhouse, carefully select and fit each piece of driftwood. I picked the straightest sections, and tried to keep the pieces as vertical as possible; this is a bit of a challenge with natural twigs and branches. Each weathered twig was tacked in place with brads, and a dab of water-resistant glue helped to secure the driftwood pieces. To cover the small gaps between the pieces of sheathing, I added another piece of driftwood. 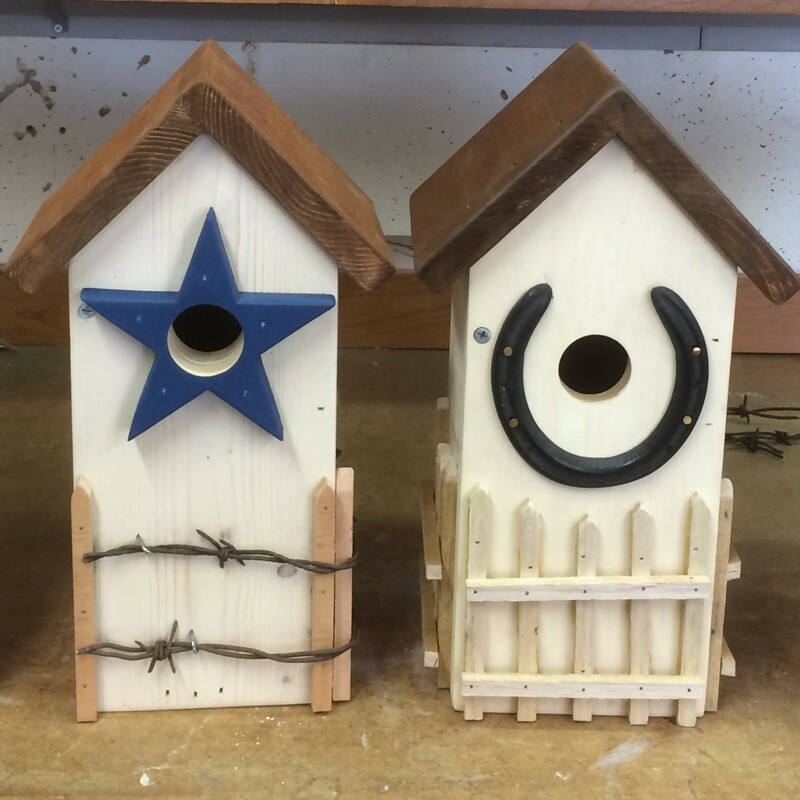 Using thinner or shorter pieces to fill the gaps added dimension and further variation to the sides of the birdhouse. The Tools for Building the Driftwood Birdhouse - The right tools make DIY projects easier. And more fun! 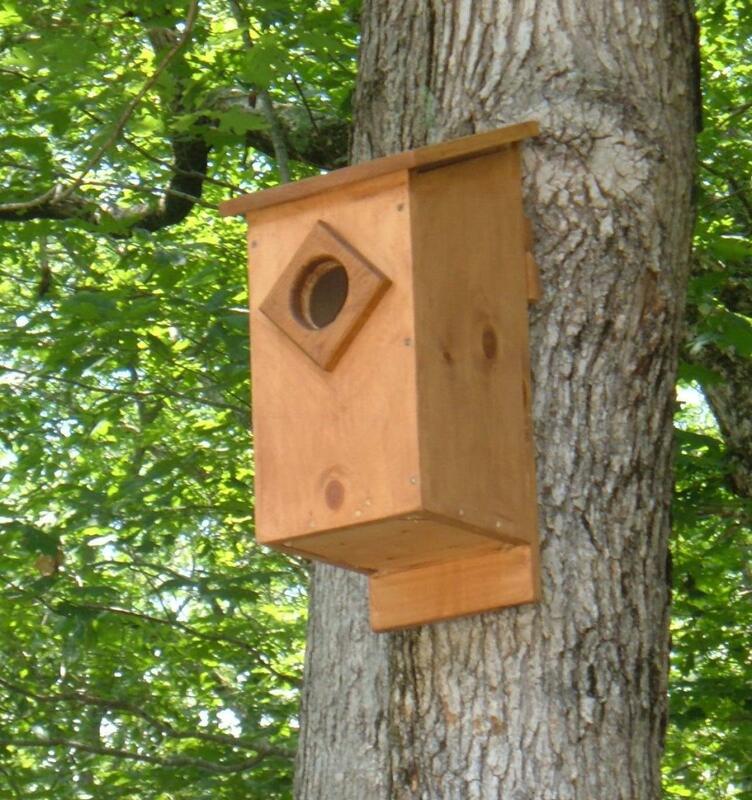 The diameter of the birdhouse's entrance hole is important; 1-1/2" is the preferred size for many small cavity nesting birds. A Forstner bit makes a clean cut through all types of wood. The side sheathing took more straight pieces than I expected. To stretch the supply of driftwood, I used a bandsaw to rip some of the larger pieces right down the center. 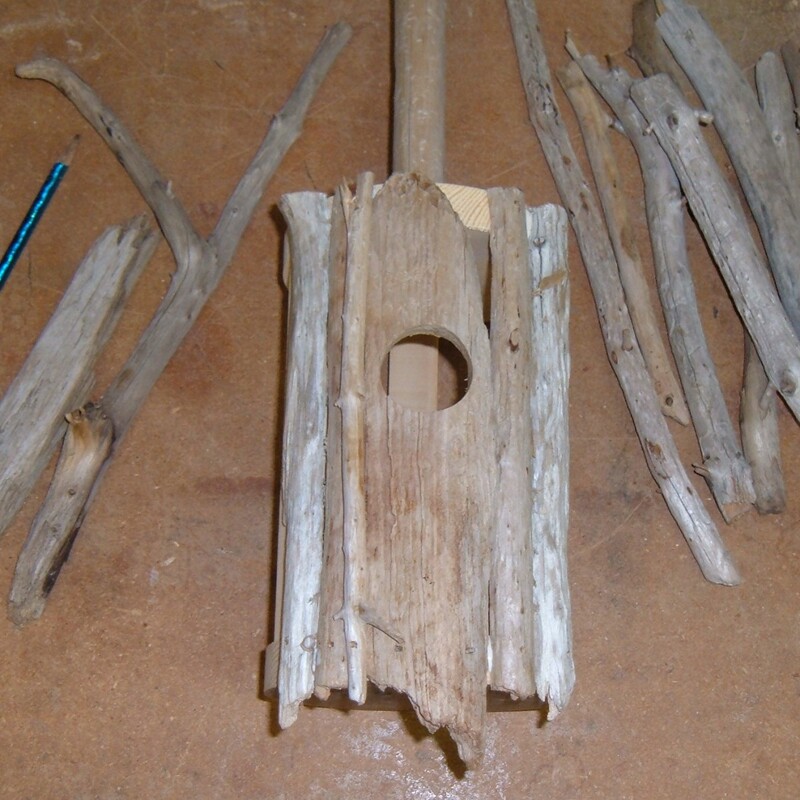 This created two usable pieces from each section of driftwood, with the flat-sawn edges fit tightly against the interior frame of the birdhouse. To avoid a uniform look, I separated the split pieces and used them in different areas of the siding. I did not want to place two pieces from the same branch side-by-side on the birdhouse. After working all of the way around the frame, the sides of the birdhouse was wrapped in driftwood. Adding a few more twigs covered the gaps. Sure, there are a few same cracks and gaps remaining between some of the pieces, but this will allow some air circulation and the overall construction is tight enough for the birds. The roof is formed by adding layers of driftwood. I started with the wider pieces to create the framework, cutting and fitting each piece to fit snugly against the center post. The naturally weathered ends extend down and over the side of the birdhouse for a rustic appearance. I beveled the cuts on each piece, striving to hide the cut ends and keep a natural look, and a few pieces took quite a bit of shaping. After I was satisfied with the fit and placement, I glued and tacked each piece in place. I continued cutting and fitting each piece for the roof, using different lengths for variety and working around the birdhouse. Smaller pieces were cut and shaped to fill the gaps and to create the layered look of shingles on a rustic roof. A few choice pieces were placed strategically for visual impact. The finished roof should shed most of the rain, but the roof is not waterproof. The wood circle used for the top of the cylinder frame will protect the baby birds from the bad weather. My driftwood birdhouse is now ready for the garden. I could drill a hole through the top of the center post and hang the birdhouse from a tree branch but I was lucky and found a driftwood post that washed up along the beach after a storm. I dragged the heavy log all the way back home and mounted the birdhouse on top. 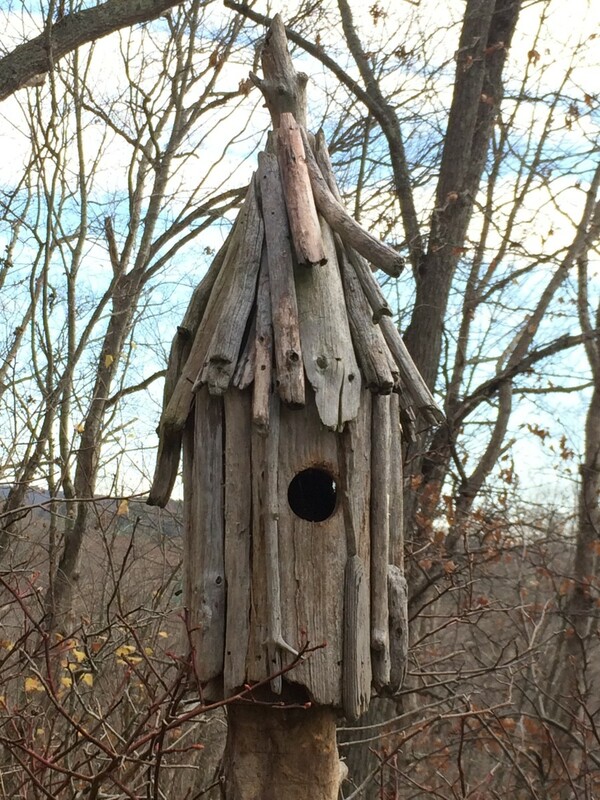 The weathered driftwood post is a perfect match for the little birdhouse. The driftwood house looks great in the garden and within a few days, a pair of wrens found the vacant birdhouse and started building their nest. 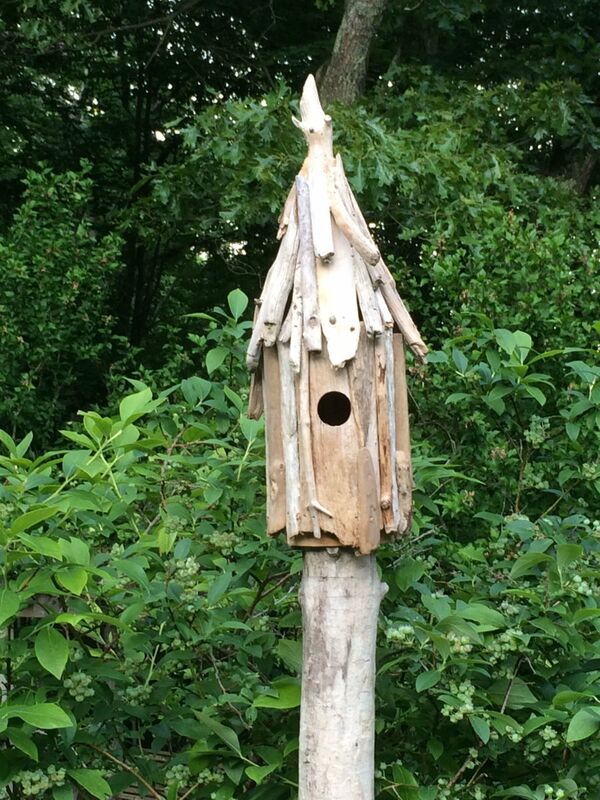 The Driftwood Birdhouse is Ready for the Garden! I live in Southern California. How do you determine the size of the holes for a driftwood birdhouse for all the various birds? I was so happy to see your face on the home page. Your wood hand crafts are always so wonderful. Thank you so much for sharing. You always come up with the most unique, fun things. The photos and direction make it easy to do the project. Well deserved purple star and congrats for making the front page. What a beautiful birdhouse! You should sell them online (I would buy one). Drift wood bird house that is a great idea . I'm not the most crafty guy, but my father in law is. He was making and selling bird houses for a while, but nothing as unique-looking as these. Well done, very creative. Very unique - I love bird houses! I love to build birdhouses! And it is even more exciting when I can watch the birds living there!i liked your lens very much! For several years, I have in the yard of a piece of driftwood. On it you cats sharpening their claws. I can't resist drfitwood - or backyard birds - but it never occurred to me to make a birdhouse from bits of my driftwood collection. What a great project!